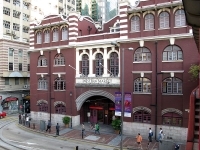 One of the best places to buy souvenirs in Hong Kong, this indoor market is held in a four-storey red brick colonial building that was constructed in 1906. After extensive renovation it re-opened in 1991 and now occupies an entire block at the western end of Central Hong Kong. The building houses a variety of shops and stalls that sell a range of products from jade curios and cloissan jewellery to assorted silks and fabrics. The fabric stores are particularly exciting and the second floor of the building is taken over by a veritable mountain of colourful fabrics of all kinds. There is a small restaurant on the first floor, and toilets on the fourth floor. However, if you aren't interested in shopping then this attraction will hold little appeal for you - if you are an architecture enthusiast you can pop in quickly to see the vaulted ceilings but there isn't much to see in the Western Market apart from the merchandise. Admiring the building from the outside will be sufficient for most, and it is often included in walking tours of the area. From the site one can hop onto Hong Kong's ancient double-decker tram headed for Wan Chai, Causeway Bay and Happy Valley. Transport: Take the MTR to Sheung Wan, exit B or C; bus or tram along Des Voeux Road to Sheung Wan. Opening times: Shops are open daily 10am to 7pm; restaurants 11am to 11pm.